Relentless Bride® Weddings, Wedding Planning, Life & Marriage: What is a colored diamond? Fancy colored diamonds are becoming increasingly popular, and come in pretty much any color that you can imagine. Color is created in diamonds as they crystalize. The normally perfect tetrahedral structure is twisted and the diamond absorbs other atoms. Instead of reflecting all available light, these diamonds will absorb some light and reflect the rest. The color you see is that of the reflected light. We know which atoms cause most of the common color changes. 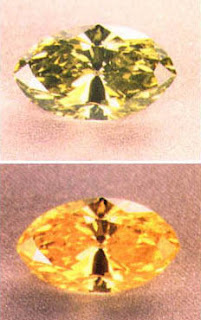 Type I diamonds have absorbed nitrogen and are generally a pale yellow. Type Ib has an even distribution and shows up as a deep yellow (canary, orange, brown, green) These are very rare. Type II diamonds have no nitrogen, but a twisted lattice structure. Type IIa-These show up yellow, brown, pink or red. Green diamonds are unique and rare. Their color is actually a result of radiation. They can have some very unique and chameleon-like properties, where they actually change color in response to light. 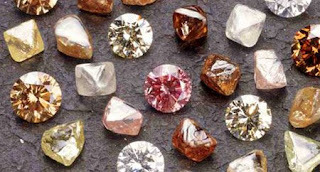 As natural colored diamonds become more popular, thanks to JLo and other high profile celebrities, there is a large preponderance of treated or manufactured stones. So it is really important to know what you are doing when picking a colored diamond. Treated diamonds as a rule have no resale value. This is because they are not stable and the color can change over time. It is really best to only by a stone that is a certified natural colored diamond. Remember the 4 c’s? Good. Now completely forget them… Colored stones are a whole different ball game. The most important element in a colored diamond (above all the C’s) is COLOR. This means that weight, shape, and other inclusions will be sacraficed to get brilliant, even color. In a colored stone it is perfectly acceptable to have some inclusions as long as they don’t interfere with the sparkle and color and you can’t see them with the naked eye. Because this is the primary rule, it means that picking a colored diamond is extremely subjective. I can give you some rules of things to look for and things I found in my experience of looking at a ton of colored stones. Look for: Maximum sparkle. This means you are going to have to look at a lot of stones to know where you are at on the sparkle scale. My stone in particular looks like it goes on forever as you gaze into the stone because of the way all of the reflection happens. This leads me to cut. The cut is going to bring out the best in the color. When cutting colored stones, some non-traditional cuts may maximize the color and sparkle. Clear diamonds have very specific proportions that maximize sparkle. These same proportions don’t work with colored stones… so you may be looking at cuts that ordinarily you would discard with a white stone. Because we are so worried about color, a bad cut (especially too shallow) can cause light leakage and “dead spots” that can interfere with the sparkle and the color. Make sure that you look at the diamond from every possible angle to see what the light does to the stone. A larger table on your diamond can make stones look lighter than they really are, and a thicker girdle (which we want to avoid in white stones) can intensify color. It also ends up making the face look a bit smaller. Color: It has to be a color that you love. Look for evenness of color. Color grading is extremely complicated. There are color charts with about 1500 unique colors, but you can bet that diamonds often don’t match those colors in the books. There are certain very “accepted” colors, so if the stone doesn’t match one of the typical colors, you get a modifying color name (brownish yellow). Here brown is the modifying color, with yellow being the predominant color. Having an ISH modifier, usually decreases the value of the stone, but also allows you to find a stone that is exactly the color that suits you best. Then there is an intensity factor. This is tacked on to the beginning of the description. They range from faint, light, normal, intense, vivid, and deep/dark. With yellow diamonds, canary is the name reserved for the deepest intensities. So now your stone is a light brownish yellow. Finally, “fancy” goes in front of stones deemed to be exceptionally brilliant. This can modify any intensity of stone except for faint. So you can have a fancy light brownish yellow stone. 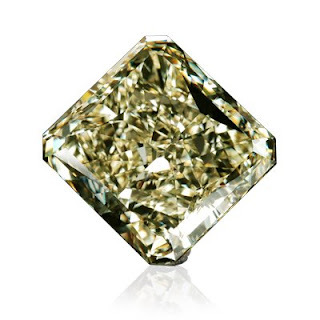 Fancy Yellow Diamond - 17.46 Carat VVS2 Fancy Yellow Radiant Cut Diamond (this is an exceptional diamond!) Image from www.lussori.com. Words of caution: Many middling white diamonds, deemed unsuitable for normal use will be color treated in a lab. Don’t buy a colored stone without a certificate. If the stone is certified by GIA, HRD, IGI, EGL, CGL, or AGS you can be sure that the color is of natural origin. If there is any doubt to the origin, then the certificate will say “undeterminable” and the stone becomes unsellable as a natural colored diamond. I opted for a yellowish-brown stone that looks closer to the yellow family than to brown. I also decided to go with a lower intensity (light), but with a fancy modifier. I originally wanted a princess cut or another square cut, but quickly realized that to achieve a really brilliant effect, there needed to be more facets. We opted for a square cut radiant diamond, which gives you all the faceting benefit of a round diamond but with the shape of a square diamond. My diamond sacrifices a little in face what it makes up for in depth, so although it is just over a carat, it faces up to seem smaller than that. I wasn’t really going for size, but was instead focused on sparkle. People definitely do a double take! Some people opt to set their yellow diamonds in a gold setting, offset by a platinum band, but I really felt that my beautiful diamond could speak for itself. So I went for a platinum band with a platinum setting. I really believe it depends on the diamond whether you go that route or not, so work with your gemologist to decide. You’ll need to see these stones in person. You can’t buy your colored stone very easily on the internet. We worked with 2 different gemologists. The first one was not a color expert, but she was able to get us a ton of stones. We viewed 9 different stones with her, and learned a lot about what we didn’t want. We saw a lot of light leakage, uneven coloring and dull stones. Then we went to a local color expert. We viewed a number of canary diamonds they had in house already. We spoke with the gemologist about what we liked and what we didn’t like. He ordered 2 stones in for us and both would have been great. The one I didn’t pick was a little darker and more intense on the color scale, but a little less brilliant, while the one I picked was incredibly brilliant and alive. The prices reflected the differences, but we feel like we got a great value for a colored diamond by buying a light yellowish brown stone! It just happens that we found a stone that was VVS2, but I would have been happy with anything up to SI. Thanks Zoliepup! This is an awesome and in depth Post! 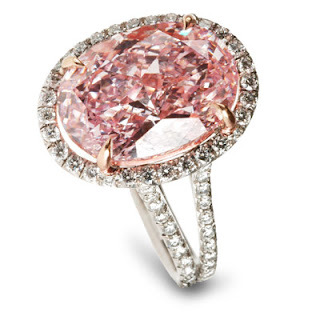 Trivia: did you know that Mariah Carey's ring is actually a FANCY LIGHT PINK Ering? Does anyone else out there have a colored diamond? Or instead of diamond and you wanted color, did you get the gemstone route? If so what kind? WOW! I just learned more than I ever thought I could about colored diamonds! I think I'd get a green or yellow one if I went for color. Oh, thanks for sharing. I love jewellery, and I love learning about jewellery. I had an option to get a blue diamond as opposed to a sapphire but I don't really get as crazy for the blue of a diamond as I do for a sapphire. And in a weird twist I found out later that my MIL got a blue diamond as her engagment ring. Great post! I've always been a fan of colored stones myself! Wow, great post!! Thanks so much for sharing!! I've learned a lot through this and I'd like to get a colored stone ring one day. Maybe an anniversary ring?! Wow! Thanks for linking to me... I had no idea! To me there's nothing more attractive than cool science and bling! I don't have a color diamond but I think for my 5th year wedding anniversary, i want a yellow or brown sugar vintage one! 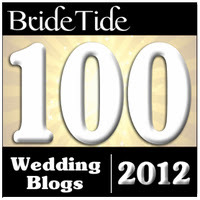 of http://www.lovesimplyhappens.com says...I just came upon your blog via Pennies in My Pocket and am saying Hello and congratulations on your wedding plans. 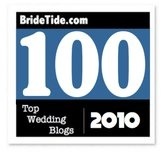 I'm a destination wedding photographer and love listening, learning and helping brides to be! Stay warm in D.C. and watch out for those birds!